I've loved diving into the deep end of sustainable fashion, but the reality is, there are a lot barriers (some real and some perceived) preventing others from doing the same. Not everyone has the time or interest to dive deep, so today, I want to address not only the most common challenges in supporting ethically made brands but also how you can overcome those barriers if you are interested in shopping more consciously. Cost - This is the major barrier for most. Because you are supporting companies who use high quality fabrics and responsible manufacturers (that pay workers a sustainable wage), the price of your garment reflects this. But not all ethically made brands are out of reach for the average consumer. You won't find Forever21 prices, but stores like Everlane and Alternative Apparel offer reasonable options that should last longer than your average fast fashion garment. And if those are still out of reach, check out your local thrift stores. By shopping second hand, you are helping to eliminate the amount of clothing that ends up in landfills while scoring some major deals. Limited Size Options - Because this is a smaller industry (with over 95% of manufacturing happening overseas), we are still waiting for main stream fashion to catch up. Therefore, there are not an endless supply of options, especially if you are plus size/petite/tall/anything outside of the size 2-12 range. But there are skilled seamstresses all over the country. So if you can't find the right fit, support their craft and have something made for you. You can buy patterns online, choose your own fabric, and have a custom dress made for less than the price of the average Nordstrom dress. And if that's too much effort, visit your local thrift store (you're going to start noticing a pattern here). Thrift stores are full of clothing from women of all shapes and sizes. Lack of Style - Ethical clothing has a reputation for having a "hippy" vibe so it can be hard to find more modern options. But designers have done an amazing job in the last several years offering more updated, stylish, and sometimes even trendy, solutions. Check out brands like Reformation and StyleSaint for options that don't look like they belong at a Woodstock festival. And if you're really looking to try out an of-the-moment-trend, again go thrifting (told you there was a theme). Thrift stores are filled with items from trend driven, fast fashion stores. So if you can't completely give up your Zara addiction, buy your pieces secondhand and give those items a second life. 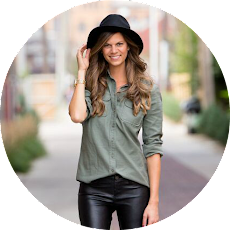 And to make it even easier, online consignment shops like ThredUp allow you to search and filter through inventory making it even easier to find what you're looking for. Lack of Clear Information - This is something I have really struggled with. Most companies, even ethically made ones, fail to disclose all the information. So even if a company prides itself on being made in the USA by fair trade workers, they may be lacking information on the fabric and toxic dyes that are used in the fabrics. It's hard to find a completely clear picture. And the reality is, the idea of "ethical fashion" isn't black and white. And trying to get to the bottom of a brand's fair trade policy can be exhausting. But more sites are emerging to make it easier to navigate the sustainability of your favorite stores. Check out Project Just to find out how ethical your go-to mainstream stores are. And if that requires more time than you're willing to commit, then yep, you guessed it... thrift! The items at thrift stores may not have originally been ethically made, but rather than supporting the production of more clothing, you are giving new life to a previously discarded garment. Time - Shopping ethically can be time consuming. You can't hop in your car and head to your nearest TJ Maxx to pick up a new outfit. And you can't buy your tees at the same place you buy your toilet paper. And most of us aren't in areas that have a lot of sustainable brick and mortar options nearby. Which means most of your shopping has to be done online and you then have to wait for items to ship. It also means you have to take the time to research different brands and designers. This means you can say goodbye to impulse purchases, which is not a terrible thing, but sometimes you just want to hop in the car and shop. By now you can probably guess my solution: thrifting! This has become my go-to shopping choice when I'm just really in the mood for some good old fashion impulse buying (although I still wouldn't recommend regularly buying for the sake of buying - a major part of shopping ethically is making thoughtful choices and buying items you will love and treasure no matter where you decide to shop.). Now it's your turn: What are the predominant challenges and barriers that you face when thinking about shopping ethically? Since announcing my departure from fast fashion, I've had a lot of people ask a lot of questions. One of the most frequently asked is "am I getting rid of all my fast fashion pieces in my closet?" Living sustainably isn't just about supporting ethical brands. It's about loving, appreciating, and using what you already own. It would be just as wasteful to get rid of everything and start over as it would be to continue buying disposable fashion. Plus, I genuinely love a lot of pieces I own - including some past fast fashion purchases. Moving forward, you'll see a mixture of previously owned items along with new, ethical brands - like this blazer from Brooklyn Tailors - an American made brand based out of Brooklyn. I was lucky enough to score this piece at 80% off before Willys Detroit closed it's doors last month and it's been one of my go-to staples since. So even though I won't be clearing out my entire closet of fast fashion, when I do shop in the future, I'll either be buying from ethical stores and brands or shopping second hand. And in the meantime, I'll be getting creative with what's already in my closet because not buying anything is the most sustainable way to live. 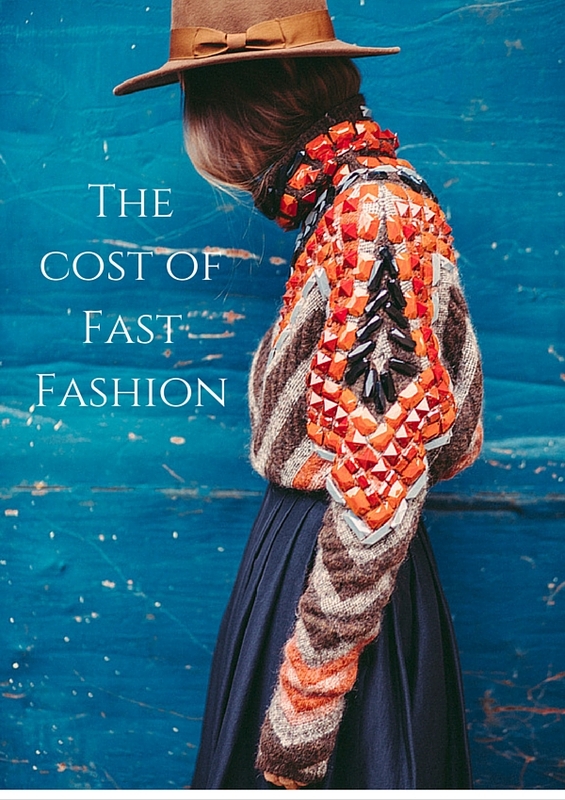 As I mentioned in my last post, fast fashion is out. It leads to millions of tons of clothing being manufactured at unsustainable rates, taking it’s toll of the environment, factory workers, and our closets. It creates an impulsive need to stay on top of the trends and always buy more. It means we are filling our closets with low quality items that we see as disposable and ultimately end up in landfills or back in the third world country that they originally came from. There is a lot of information out there about the negative effects of fast fashion on the environment, the workers, and the communities in which they are being produced. So instead of overloading you with enough facts and statistics to fill a book (those already exist - check out this one and this one), I’m going to keep this simple and share some of the most personally staggering statistics I’ve learned on this journey so far (all quotes from The True Cost documentary). “In the 1960s, 95% of clothes were made in America. Now 3% is. 97% is outsourced to developing countries.” That number is staggering. This just reaffirms the need to buy and support local! “The average American throws away 82 pounds of textile waste a year, adding up to over 11 million tons of textile waste from the US alone. Most is non-biodegradable, which means it sits in landfills for over 200 years, emitting harmful gasses into the air.” 82 pounds of waste? From clothing? Per person?? Avoid being part of the problem by shopping with more intention. Really think about each item. Do you really love it? Or will it be added to your 82 pounds of waste next year? “Only 10 % of donated clothes are sold in thrift stores. The rest is shipped off to third world countries, like Haiti, where the castoffs could conceivably end up being worn by the very people who made them.” These second hand pieces aren’t being given away for free. They are being sold (at prices that are still difficult to afford). This has also dramatically effected the local textile industry, which is now disappearing because of the flooding of second hand clothing. These economies are no longer importing garments because most of the workers are selling our used clothing. “Fashion today is the number 2 most polluting industry on earth. Second only to the oil industry.” Our disposable habits are destroying the environment. Period. These facts do a damn good job of showing how our wastefulness effects our environment. But what about the people creating the clothes? They - and the communities in which they live - are the ones who are effected in real time, every single day. Clothing is not made in a factory by machines. Clothing is made by people. Men and women who are literally dying because of the overconsumption of first world countries. In 2013, the collapse of a factory in Bangladesh killed over 1000 workers - workers who had called attention to the failing infrastructure of the building, but because of the lack of rights, fair wages, and labor laws, their concerns were ignored. Workers in Bangladesh - where most of our clothing is made - get paid the lowest minimum wage in the world, making less than $50 a month. So the people with the worst working conditions anywhere in the world are making the least amount of money. Making our clothes. The toxic chemicals used to produce are clothes are skyrocketing the rate of cancer and other health related issues in the areas making our clothes. Children, surrounded by the toxicity, are effected and are getting sick and dying. And guess what? Those toxins also get absorbed into the people who end up wearing the clothes - people like you and me. To sum it all up: “The price of clothing has gone down, but the cost has gone up.” Our addiction to overconsumption and fast fashion is costing us so much more than the $9.99 Forever21 top. So you're probably thinking now what?? Where do I shop? Can I shop? How to I get the most value out of my wardrobe? Can I shop ethically on a budget? It's unlikely that most of you are going to give up shopping. And it's even unlikely that most of you will give up fast fashion. But there are smarter ways to do it, ways that can work for everyone, regardless of your budget or stance on ethical fashion. So stay tuned as I share ways to shop with intention. I've been thinking about this topic for a long time. Wondering when I would write it. How I would write it. If I could write it. Because once you put something on paper and put it out into the universe, you have a responsibility to own up to your words. And to be honest, I don’t know if I’m strong enough to own up to these words. Able to avoid temptation. Actually willing to commit. But it’s time. I’m ready to commit. I have to commit. I have a Confession: I am addicted to fast fashion. And today, I am quitting it. We live in a world of instant gratification - you can get a date by the swipe of a finger and a full meal in the amount of time it takes to pull around the drive thru. It’s no surprise the fashion industry is doing what it can to keep up. No more waiting for fashion to slowly trickle down from the runways to the manufacturers to the stores to your closet. But what is the cost of this phenomenon? In a future post, I’ll be sharing the extreme and horrifying cost this industry has on the environment and the workers creating the garments. But what effect does the fast fashion industry have on me - the average consumer? What does it mean to buy into the fast fashion lifestyle? It means I can go to Target or H&M multiple times a week and constantly get new products; It means spending more money on lower quality items; It means filling my closet with quantity, not quality; It means extra pressure to keep up with the ever changing trends; It means frustration in my closet because it is literally overflowing with clothes, but having few pieces that I truly love, that fit, and are made well; It means I am constantly dissatisfied with my clothing options; It means I am being marketed at by stores all. the. time. for the next quick fix. It means it's a vicious exhausting cycle. Personally, if I’m being honest, really honest, it also means I have an issue - ahem, an addiction - with over consumption and spending countless amounts of money on crap. Crap I don’t need (or really even want). Like most, I have depended on the ease, the affordability, the excitement (even if temporary) of newness of fast fashion. So I’ve done one hell of a job avoiding coming to terms with my own guilt about the fast fashion industry. If ignorance is bliss, I have remained deliberately ignorant for a long time. But those 20 dollar items add up. Fast. I tell myself I can’t afford quality garments, but when I look at the amount of money I spend on cheap clothes, I could have saved up to have an incredibly beautiful wardrobe of well-made, ethically sourced pieces that will last. As a fashion blogger, I am regularly indulging this culture of consumerism and over consumption and overwhelmed by the pressure to keep up with the newest trends and “it” item. But as a stylist, I am always encouraging my clients to rid themselves of clutter and pieces that no longer suit their lives, and to buy less. To be mindful of their purchases. To support quality over quantity. It’s time I start taking my own advice. For starters, I am going to stop turning to stores like H&M, TJ Maxx, and my favorite, Zara, for a quick fix. 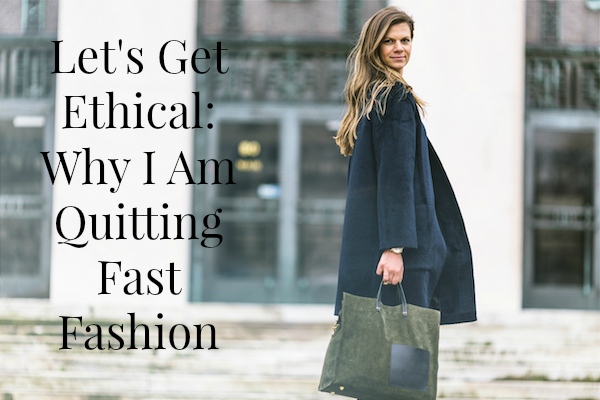 I’m done with “quick fixes.” The fastest way to support the ethical fashion movement is to slow down and shop less. To stop treating clothing like it's disposable. And when you do shop, to be aware of what you are buying. So, I’m not just quitting fast fashion, I’m also going to start supporting ethically made garments. I want to know where my clothes come from and become a more conscientious and mindful shopper. I want to do better with my own personal consumption. 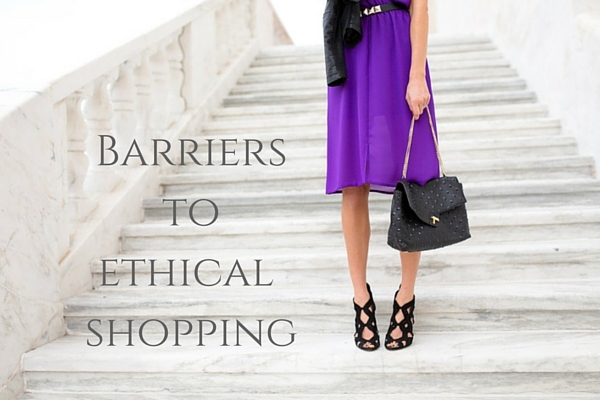 To me, ethical fashion is about reshaping our attitudes towards clothing and shopping. About valuing what we currently have and ridding this internal voice that is telling us (sometimes screaming at us) that we need more, more, more. It's learning to stop the impulse buying and start thoughtfully making purchases based on what I actually need (and yes, sometimes really want). It’s about acknowledging where a garment comes from and how it's made and how long I plan to wear it before I buy it. It's time to stop treating our clothing as disposable. It means walking away from fast fashion and supporting slow fashion. I’m not going to lie, committing to slow fashion is scary to me. Both my passion - as a fashion blogger - and my business - as a personal stylist - have relied on fast fashion. Can I continue both without it? Can I keep up with the other bloggers? Will I be judged? Will people fear I am judging them? Will my readers become disengaged? But this is a personal choice I am pursuing. I don’t want others to feel judged. I recognize the importance of convenience and low-costs items for many shoppers. So, while many of you will continue your shopping habits, I’m hoping to bring awareness, share other options, and support my personal styling clients within their values, choices and preferences – not my own. But I’m looking forward to the challenge and hope you all will gain some insight and knowledge as I explore this process. I’m looking forward to supporting artists and makers and creators. To supporting companies who support their workers. To supporting those who are buying and creating eco-friendly, sustainable garments. Finally, I look forward to showing that slow fashion can compete in the fast pace world of the fast fashion industry in terms of style. Because this is, after all, a style blog. I'm ready to slow down and embrace the slow fashion movement.